OXFORD, Miss. – An education at the University of Mississippi’s Meek School of Journalism and New Media often results in recognition, and several Ole Miss students have been honored nationally for their journalistic endeavors. A team of students led by instructional assistant professors Ji Hoon Heo and John Baker placed in the top 20 in the Hearst Journalism Awards Multimedia Team Reporting competition. Marlee Crawford, a senior from Oxford; Lana Ferguson, a senior from Mechanicsville, Virginia; Abbie McIntosh, a junior from Cypress, Texas; Italiana Anderson, a senior from Ridgeland; and MacKenzie Ross, a senior from Oxford, were recognized for their multimedia coverage of Hurricane Harvey. 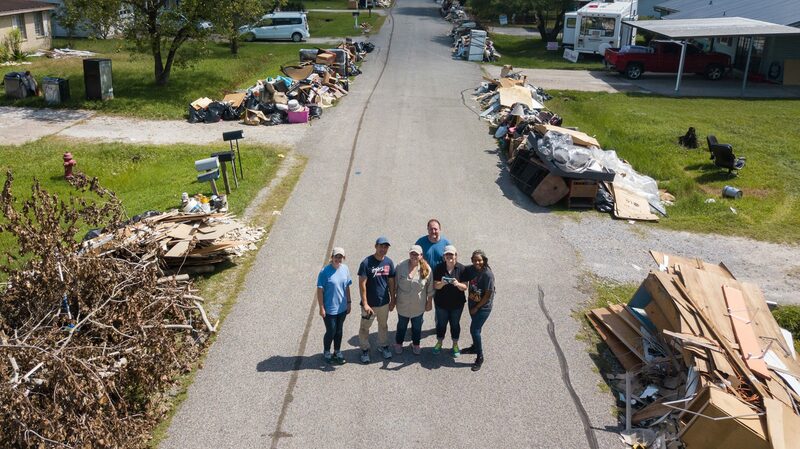 The group spent three days in Orange County, Texas, last September, accompanying a relief group sent from a local church. While much of the news coverage nationally focused on the metropolitan area of Houston, not many outlets covered the stories of recovery in this small, blue-collar refinery town. The result was a multimedia piece that included written stories, videos, maps, audio clips and encompassing views shot with a drone. “The idea was that all of these stories could stand alone, but could also fit together and give the viewer an experience that’s a little more than just what the stories would do,” Baker said. The students immersed themselves in the experience, building relationships with community members and sharing meals and lodging with the relief workers. “They really latched onto that group, which helped us get the good story, rather than just an outside view of what was going on,” Heo said. “All of these students were trained journalists, but waking up early, researching, finding sources and identifying the stories on the spot is stuff you can’t learn in the classroom. The project, found at http://harvey.thedmonline.com/, earned the school’s first honors from Hearst in this multimedia competition. The endeavor involved a lot of late nights and extra work from students on a purely volunteer basis over the course of about seven months, but the students, instructors and members of the Orange County community were pleased with the result. “Most of the folks in the stories were so happy that they were part of this project,” Heo said. “We really got to know them, and I think we did justice in telling their story. Ross also received recognition for her design of the multimedia project from the Society for News Design student competition. She earned third place recognition for the piece, as well as third place recognition for her design of the magazine cover for The Struggle for Sri Lanka. Maria Morrissette, a recent graduate from Oxford, earned second place honors for her stand-alone multimedia piece “An Emerging Jewel,” found at http://olemissinsrilanka.com/. The Society for News Design is an international professional organization for visual communicators that hosts workshops, conferences and other development opportunities each year. The video tells the story of 12-year-old Sarah Harmon, a young girl who was born blind and excels in music, specifically playing the piano. It can be seen at https://bea2017.secure-platform.com/a/gallery/rounds/1372/details/29190. The Broadcast Education Association is an academic media group that hosts a variety of programs to advance careers for educators, students and professionals in the field of broadcast journalism. For more information about the journalism education at UM, visit https://meek.olemiss.edu/.